It’s the weekend and sometimes you just want to have a beer. 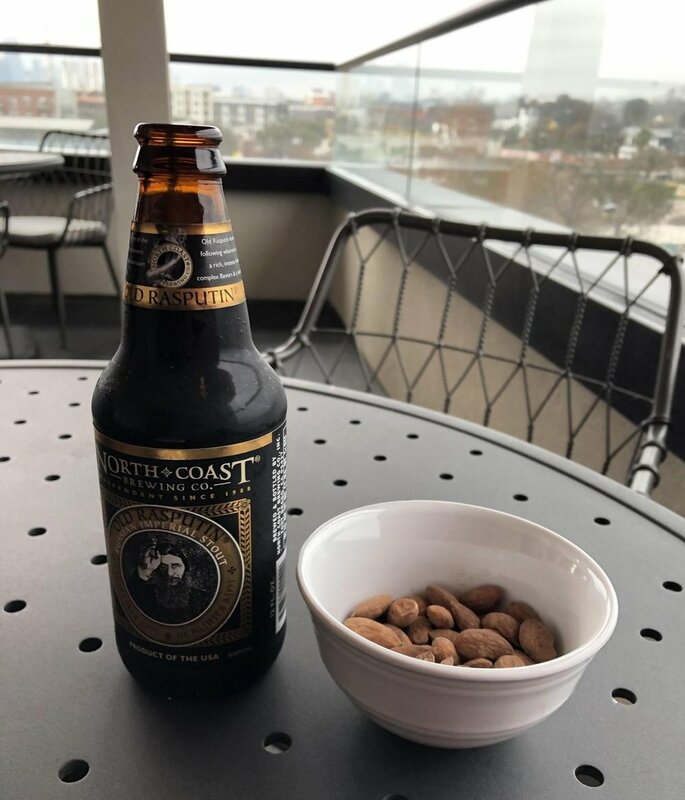 It’s Friday evening, about 5pm and I’m working on the rooftop of my apartment and I think, “I would really enjoy a beer and some almonds while I finish up my work for the night.” Yea guys, beer is not keto friendly. If you are in your first couple weeks adapting to keto, you should avoid most all alcohols, even low carb ones. However, if you are more keto-adapted and you are living keto as a lifestyle, then every once in a while treating yourself can be a good thing. To add a quick note to that. Alcohol is not good for us physiologically, even if you have read that a glass of wine is like an hour of exercise. This just isn’t true. But psychologically, alcohol may be good. For some people it is a stress release, a way to socialize, or a way to take a break from a healthy lifestyle and enjoy yourself. However, it shouldn’t become a crutch or a dependence, that is when all possible benefits are lost. I decided to go ahead and treat myself and have a beer and bowl of almonds, but I also decided to turn it into a self-experiment along the way. I didn’t choose a light beer because quite frankly I don’t enjoy them and they aren’t worth it to me. Light beers are typically lower in carbs and calories and may be better for limiting an impact on glucose and ketones but I prefer a good dark beer and would rather have that but limit the times I do. So I chose one of my favorite types of beer, a good ol’ stout. So, I drank the stout, ate the almonds, both were delicious and I tested my ketones and blood glucose. This is what I saw. Beer & Almonds Impact on Blood Glucose and Ketones? Question: If you are keto-adapted, what is the impact of a beer and some nuts on your ketone and glucose levels. Baseline ketones and glucose were tested about two hours after consuming food. A stout beer and 2 servings of organic dry roasted almonds were consumed within 15 minutes. Next blood test was completed right after the beer and almonds were finished and then in 15 minutes intervals afterwards. Ketones and glucose were tested using a Keto Mojo meter. 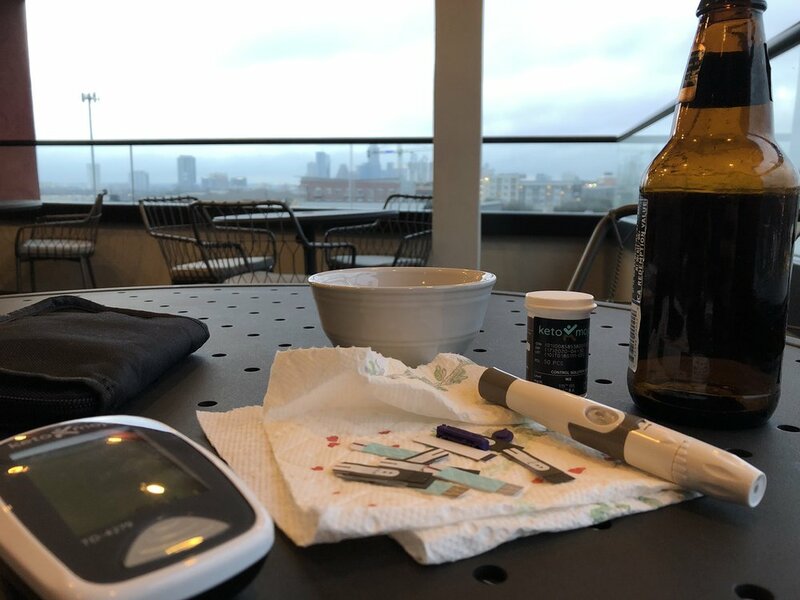 As you can see from the graphs below, I had about a 16 point increase in my blood sugar when I tested right after the beer and nuts were consumed. However, every 15 minutes after that my blood glucose dropped lower and lower until it was 85. My ketone levels took a slight dip but then seemed to bounce back rather quickly. I also was never fully kicked out of ketosis. I would speculate that since I have been following keto for so long, my body is probably pretty resilient and can maybe handle an occasional beer without being kicked out of ketosis. I would not recommend someone who is new to keto to try this yet. However, If you are keto-adapted and you want to treat yourself every once in a while, try it and test yourself. See how your body responds and learn what it can handle! If you are into beers, check out one of my buddies, craft beer blogs!